Celebrate Australia Day with these sweet green and gold pavlovas! Drain the chickpeas over a large bowl (it’s the water or aquafaba you want but you can place the chickpeas in the fridge in an airtight container and use in another recipe). Use an electric whisk to whip the water into soft peaks, which will take around 5 minutes. Add the vinegar and continue whisking for another minute. Gradually add the sugar, a spoonful at a time with the whisk running and continue whisking for another couple of minutes until smooth, shiny and increased in volume. Spoon or pipe the mixture onto a wire rack lined with baking paper, into 8 rounds about 10 cm each. Reduce the oven to 120°C and bake for 2 hours until they are firm and dry on the outside. Open the oven and leave the meringues in the oven to cool with the door ajar. Beat the cream with lime zest and icing sugar until smooth, adding some of the liquid left in the can if too stiff and then use to fill the meringues. 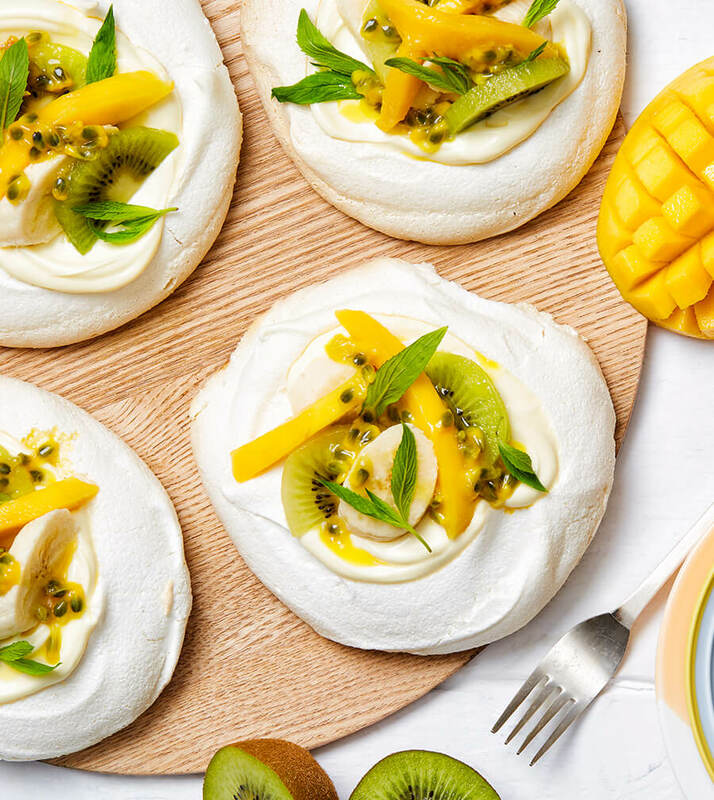 Add a tablespoonful of passion fruit pulp to each meringue then top with banana and kiwi slices.